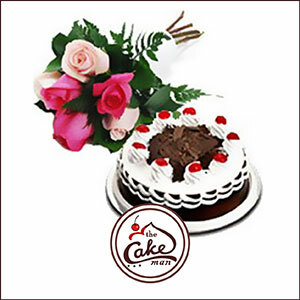 Present this beautiful combo of a delicious Black forest cake and an eye-pleasing bouquet of six mix roses to someone who is very special to you. 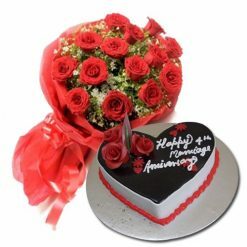 3 pink rose and 3 white rose decorated with decorating leaves and a yummy black forest cake will be a lovely surprise for occasions like wedding anniversary, birthday or any special day. This amazing combo will surely take the breath away of those who will lay their eyes on it. 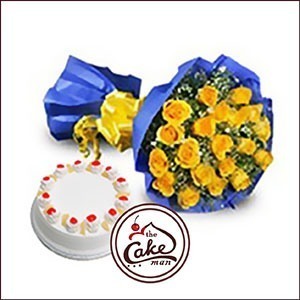 We are providing you this elegant bunch of yellow roses along with a yummy and colourful pineapple cherry cake. This bouquet of yellow rose are neatly packed in a beautiful blue sheet and given a glamorous look by tying a yellow fancy bow. The combination of yellow roses and a yummy pineapple cherry cake expresses warmth, friendship, and happiness. This glamorous combo gift is a sweet and elegant way to show your loved ones how special they are to you. 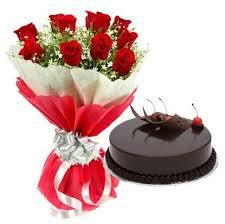 Surprise Gift with Chocolate and Banquets combo is a pleasant surprise for your beloved. The combo of a delicious mouth-watering chocolate cake, a lavish Ferrero Rochar chocolate box along with a beautiful bouquet of pink roses and white lilies wrapped in a pink paper and tied with a pink bow, creates the era of love and romance. This lovely combo delivers a never ending smile with sweetness and fragrance and it will surely mesmerize your loved ones on their special day. 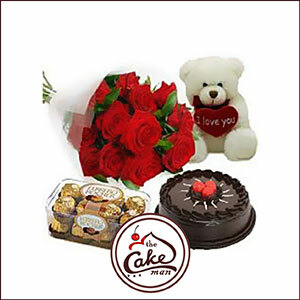 This Sweet combo is fully loaded with a bouquet of red roses, a delicious chocolate cake, a box of rich Ferrero Rocher chocolate and a cute white teddy bear with a heart on it, expressing love for your sweetheart. 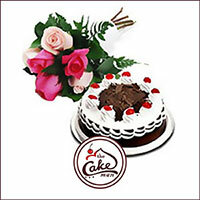 All the roses are elegantly packed with a white transparent paper to show love for your dear one. 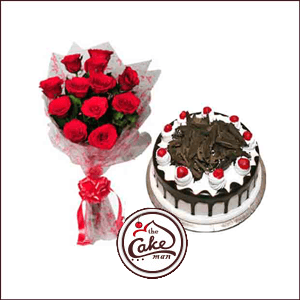 The chocolate cake, yummy Ferrero Rocher chocolates and a cuddly teddy are finely complementing the bouquet of red roses. 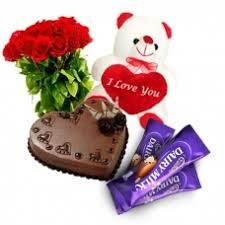 Gift this Sweet Combo on anniversary day to make your Sweetheart feel special.